The Mackenzie River (Slavey language: Deh-Cho IPA: [tèh tʃʰò], big river or Inuvialuktun: Kuukpak IPA: [kuːkpɑk], great river; French: fleuve (de) Mackenzie) is the longest river system in Canada, and has the second largest drainage basin of any North American river after the Mississippi River. The Mackenzie River flows through a vast, thinly populated region of forest and tundra entirely within the Canadian Northwest Territories, although its many tributaries reach into four other Canadian provinces and territories. The river's main stem is 1,738 kilometres (1,080 mi) long, flowing north-northwest from Great Slave Lake into the Arctic Ocean, where it forms a large delta at its mouth. Its extensive watershed drains about 20 percent of Canada. It is the largest river flowing into the Arctic from North America, and including its tributaries has a total length of 4,241 kilometres (2,635 mi), making it the thirteenth longest river system in the world. Through its many tributaries, the Mackenzie River basin covers portions of five Canadian provinces and territories – British Columbia (BC), Alberta, Saskatchewan, Yukon, and Northwest Territories. Thutade Lake, in the Northern Interior of BC, is the ultimate source of the Mackenzie River via the Finlay–Peace River system, which stretches 1,923 kilometres (1,195 mi) through BC and Alberta. The 1,231-kilometre (765 mi) Athabasca River originates further south, in Jasper National Park in southwest Alberta. Together, the Peace and Athabasca rivers drain a significant portion of the eastern slope of the Rocky Mountains and the central Alberta prairie. The Peace contributes the majority of the water, about 66 km3 (54 million acre-feet) per year, and the Athabasca contributes 25 km3 (20 million acre-feet). The Peace and Athabasca meet at the Peace-Athabasca Delta, a vast inland delta at the western end of Lake Athabasca, which also takes runoff from the northern third of Saskatchewan. The Slave River is formed by the confluence of the two rivers and flows 415 kilometres (258 mi) due north into Great Slave Lake, at Fort Resolution, Northwest Territories. The Slave is by far the largest river flowing into the lake, with an annual flow of 108 km3 (87 million acre-feet). It contributes about 77% of the overall inflow, and forms a large delta where it enters the lake. Other rivers entering Great Slave Lake area the Taltson, Lockhart and Hay Rivers, the latter of which also extends into Alberta and BC. The Mackenzie River issues from the western end of Great Slave Lake about 150 km (93 mi) south-west of Yellowknife. The channel is initially several kilometres wide but narrows to about 800 m (2,600 ft) at Fort Providence, which was historically an important ferry crossing in the summer, and used as an ice bridge in the winter for traffic along the Yellowknife Highway. In 2012 the Deh Cho Bridge was completed at a point about 10 km (6.2 mi) upstream, providing a safer permanent crossing. It is the only bridge across the main stem of the Mackenzie. West of Fort Providence the Mackenzie widens considerably, resembling a shallow, swampy lake more than a river; one large widening here is known as Mills Lake. After heading west for about 100 km (62 mi) the Mackenzie narrows and turns northwest through a long stretch of fast water and rapids, past the village of Jean Marie River. At Fort Simpson it is joined by the Liard River, its biggest direct tributary, from the west. The Liard drains a large area in the southern Yukon and northern BC and carries a large amount of sediment during the summer melt – which does not fully mix with the clear water in the Mackenzie for almost 500 km (310 mi) downstream, with the resulting phenomenon of a clear current on the east bank and muddy water on the west bank. The river continues west-northwest until its confluence with the North Nahanni River, where it turns north towards the Arctic. It flows through open taiga with its wide valley bounded, on the west, by the Mackenzie Mountains and to the east by low hills of the Canadian Shield. 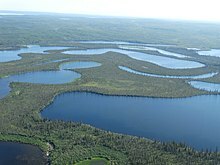 This mostly uninhabited area is called the Mackenzie Lowlands; although partly forested, it is mostly covered by large areas of muskeg, swamps and many small lakes. A number of major tributaries join from the west, including the Root River, Redstone River and Keele River. Below the Keele River, the Mackenzie River flows north along the western base of the Franklin Mountains before turning northwest, and receives the Great Bear River, the outflow of Great Bear Lake at Tulita. The Mackenzie widens considerably to about 6 to 7 km (3.7 to 4.3 mi) at Norman Wells, a major center of oil production. There is a narrows at the Mountain River confluence called the Sans Sault Rapids, where the Mackenzie falls about 6 metres (20 ft). Below the Mountain River the Mackenzie flows due north until reaching The Ramparts, a limestone gorge barely 500 metres (1,600 ft) wide and up to 45 metres (148 ft) deep. Below The Ramparts is the village of Fort Good Hope, where the Mackenzie turns northwest again, soon crossing the Arctic Circle. The Mackenzie here flows slightly lower in elevation than the surrounding tundra, as a braided river between low bluffs about 3 to 5 km (1.9 to 3.1 mi) apart. It receives the Arctic Red River from the southwest at Tsiigehtchic, where traffic on the Dempster Highway crosses via ferry/ice bridge. About 30 kilometres (19 mi) northwest of Tsiigehtchic is Point Separation, the head of the vast Mackenzie River Delta, whose branching channels, ponds and wetlands spread across more than 12,000 square kilometres (4,600 sq mi) of the coastal plain. The delta is nearly 210 km (130 mi) from north to south, and ranges in width from 50 to 80 km (31 to 50 mi). 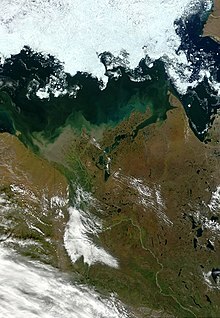 It is the second biggest Arctic delta in the world, after the Lena River delta in Russia. Most land in the Mackenzie delta consists of permafrost, with great depths to bedrock. A characteristic feature of the delta is its numerous pingos, or hills of earth-covered-ice – some 1,400 of them. The Peel River, carrying much of the runoff from the northern Yukon, joins in the delta at a point northeast of Fort McPherson. Below there, the Mackenzie diverges into several large channels with the largest heading north-northeast, emptying into the Beaufort Sea west of Tuktoyaktuk. 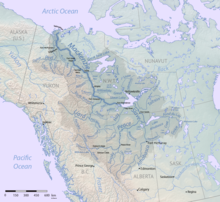 At 1,805,000 km2 (697,000 sq mi), the Mackenzie River drainage basin encompasses nearly 20 percent of Canada. About 980,000 km2 (380,000 sq mi), or 54 percent of the basin, lies above Great Slave Lake. Permafrost underlies about three-quarters of the watershed, reaching up to 100 m (330 ft) deep in the Mackenzie Delta. As a whole, the Mackenzie basin receives only meager to moderate rainfall, averaging 410 millimetres (16 in) over the entire basin, though mountain areas experience much higher precipitation, and areas near and north of the Arctic Circle receive much lower precipitation. The Mackenzie drainage basin is bordered by multiple major North American watersheds. Much of the western edge of the Mackenzie basin runs along the Continental Divide. The divide separates the Mackenzie watershed from that of the Yukon River, which flows to the Bering Strait; and the Fraser River and Columbia River systems, both of which empty into the Pacific Ocean. Lowland divides in the north separate the Mackenzie basin from the Arctic Ocean watersheds of the Anderson, Horton, Coppermine and Back Rivers. In the east, the Mackenzie borders on the Hudson Bay watersheds of the Thelon and Churchill Rivers, and to the south it is bordered by the Saskatchewan–Nelson River system, which also empties into Hudson Bay. The Mackenzie system is hydrologically connected to the Hudson Bay watershed via Wollaston Lake, which is not only the source of the Fond du Lac tributary of Lake Athabasca, but also of the Cochrane River, which flows east into the Churchill River. The eastern portion of the Mackenzie basin is dominated by vast reaches of lake-studded boreal forest and includes many of the largest lakes in North America. By both volume and surface area, Great Bear Lake is the biggest in the watershed and third largest on the continent, with a surface area of 31,153 km2 (12,028 sq mi) and a volume of 2,236 km3 (536 cu mi). Great Slave Lake is slightly smaller, with an area of 28,568 km2 (11,030 sq mi) and containing 2,088 km3 (501 cu mi) of water, although it is significantly deeper than Great Bear. The third major lake, Athabasca, is less than a third that size with an area of 7,800 km2 (3,000 sq mi). Six other lakes in the watershed cover more than 1,000 km2 (390 sq mi), including the Williston Lake reservoir, the second-largest artificial lake in North America, on the Peace River. The river discharges more than 325 cubic kilometres (78 cu mi) of water each year, accounting for roughly 11% of the total river flow into the Arctic Ocean. The river is frozen for most of the year, with the ice typically breaking up by early to mid-May in the south, and late May-early June in the north. Ice breaks up earlier on the tributaries, sometimes causing ice jams and flooding where they meet the Mackenzie. In the middle of the larger lakes, such as Great Slave, ice can persist as late as mid-June. The river typically freezes by late October or November, starting in the north. Year round, the Mackenzie's outflow has a major stabilizing effect in the local climate above the Arctic Ocean with large amounts of warmer fresh water mixing with the cold seawater. The average flow rate at the mouth is 9,910 m3/s (350,000 cu ft/s), the second largest in Canada after the St Lawrence, and the fourteenth largest in the world. About 60 percent of the water comes from the western half of the basin, which includes the Rocky, Selwyn, and Mackenzie mountain ranges out of which spring major tributaries such as the Peace and Liard Rivers, which contribute 23 and 27 percent of the total flow, respectively. In contrast the eastern half, despite being dominated by marshland and large lakes, provides only about 25 percent of the Mackenzie's discharge. During peak flow in the spring, the difference in discharge between the two halves of the watershed becomes even more marked. While large amounts of snow and glacial melt dramatically drive up water levels in the Mackenzie's western tributaries, large lakes to the east retard springtime discharges. Spring floods from the Peace-Athabasca system are significantly slowed by the delta area at the western end of Lake Athabasca causing the lake to rise, and the excess water can only flow out after the rivers have receded. The same phenomenon occurs at Great Slave Lake, which naturally regulates the flow from the Slave River into the Mackenzie. There are river gages at several upstream points along the Mackenzie River. The average flow rate at the outlet of Great Slave Lake is 4,269 m3/s (150,800 cu ft/s). At Fort Simpson, below the Liard River, it is 6,769 m3/s (239,000 cu ft/s). At Norman Wells it is 8,446 m3/s (298,300 cu ft/s), and at the Arctic Red confluence it is 8,926 m3/s (315,200 cu ft/s). As recently as the last glacial maximum about 30,000 years ago, the majority of northern Canada was buried under the enormous continental Laurentide ice sheet. The tremendous erosive powers of the Laurentide and its predecessors, at maximum extent, completely buried what is now the Mackenzie watershed under thousands of metres of ice and flattened the eastern portions of the watershed. When the ice sheet receded for the last time, it left a 1,100 km (680 mi) long postglacial lake, Lake McConnell, of which Great Bear, Great Slave and Athabasca Lakes are remnants. Today's Mackenzie River is very young in geologic terms – its channel formed over a period of no more than several thousand years as the ice sheet retreated. Prior to the ice ages, only the Peel River tributary flowed through what is now the Mackenzie Delta into the Arctic Ocean. The other tributaries of the Mackenzie combined into the "Bell River" which flowed east into Hudson Bay. During glaciation the weight of the ice sheet depressed northern Canada's terrain to such an extent that when the ice retreated, the Mackenzie system was captured to lower elevations in the northwest, establishing the present flow direction to the Arctic. Fluvial deposits and other erosional evidence indicate that around the end of the Pleistocene, about 13,000 years ago, the Mackenzie channel was scoured by one or more massive glacial lake outburst floods unleashed from Lake Agassiz, formed by melting ice west of the present-day Great Lakes. At its peak, Agassiz had a greater volume than all present-day freshwater lakes combined. This is believed to have disrupted currents in the Arctic Ocean and led to an abrupt 1,300-year-long cold temperature shift called the Younger Dryas. The Mackenzie carries a very large sediment load, transporting about 128 million tonnes each year to its delta. The Liard River alone accounts for 32 percent of the total, and the Peel River about 20 percent. Essentially all of the sediment is contributed by areas downstream of Fort Providence, since upstream sediment is trapped in Great Slave Lake. The Mackenzie River's watershed is considered one of the largest and most intact ecosystems in North America, especially the northern half. Approximately 63% of the drainage basin, or 1,137,000 km2 (439,000 sq mi), is forested (mostly boreal forest). Wetlands comprise about 18%, or about 324,900 km2 (125,400 sq mi), of the basin. More than 93% of forested areas are virgin old-growth forest. However, human activities such as oil extraction have threatened water quality in the headwaters of the Mackenzie River. In addition, a warming climate in northern parts of the watershed is melting permafrost and destabilizing soil through erosion. Most of the taiga consists of black spruce, aspen and poplar forest. In the north, the river's shores are lined with sparse vegetation like dwarf birch and willows, as well as extensive areas of muskeg and peat bogs. South of Great Slave Lake, there are much larger reaches of temperate and alpine forest, prairie, and fertile floodplain and riparian habitat. There are 53 fish species in the basin, none of them endemic. The Mackenzie River has a similar range of fish fauna to the Mississippi River system. It is believed that the two river systems were connected during the Ice Ages by meltwater lakes and channels, allowing fish in the two rivers to interbreed. Fish in the Mackenzie River proper include the northern pike, several minnow species, and lake whitefish. Fish in the southern half of the watershed are genetically isolated from those of the northern half due to large rapids on the Slave River preventing fish from swimming upstream. Migratory birds use the three major deltas in the Mackenzie River basin – the Mackenzie Delta and the inland Slave and Peace-Athabasca Deltas – as resting and breeding areas. The latter is located at the convergence of four major North American migratory routes, or flyways. As recently as the mid-twentieth century, more than 400,000 birds passed through during the spring and up to a million in autumn. Some 215 bird species in total have been catalogued in the delta, including endangered species such as the whooping crane, peregrine falcon and bald eagle. The construction of the W.A.C. Bennett Dam on the Peace River has reduced the seasonal variations of water levels in the delta, causing damage to its ecosystem. Bird populations have seen a steady decline since the 1960s. Water mammals such as beavers and muskrats are extremely common in the Mackenzie Delta and surrounding areas of muskeg. The Mackenzie estuary is also a calving area for beluga whales. The Mackenzie River enters the Beaufort Sea, July 2017. About 7 percent of the fresh water that flows into the Arctic Ocean each year comes out the Mackenzie and its delta, and much of that comes in large pulses in June and July after the freshet—when inland ice and snow melts and floods the river. The Mackenzie valley is believed to have been the path taken by prehistoric peoples during the initial human migration from Asia to North America more than 10,000 years ago. However, archaeological evidence of human habitation along the Mackenzie is scant, despite the efforts of many researchers. Many archaeological sites have probably been destroyed by flooding, freeze-thaw and erosion. The Inuvialuit, Gwich'in and other indigenous peoples have lived along the river for thousands of years; however, the oldest evidence of continuous occupation stretches back only about 1300–1400 years, at the Gwich'in community of Tsiigehtchic. The Mackenzie provided the major route into Canada's northern interior for European explorers as early as the late 18th century. Scottish explorer Alexander Mackenzie travelled the river in the hope it would lead to the Pacific Ocean, but instead reached its mouth on the Arctic Ocean on 14 July 1789. The river he named "Disappointment River"[dubious – discuss] would later be renamed in his honor. No European reached its mouth again until Sir John Franklin on 16 August 1825 during the 1825–1827 Mackenzie River expedition. The following year he traced the coast west until blocked by ice while John Richardson followed the coast east to the Coppermine River. In 1849 William Pullen reached the Mackenzie from the Bering Strait. In the following decades the North West Company established forts on the river, the precursors of present-day settlements such as Fort Simpson (formerly Fort of the Forks). A lucrative fur trade was carried out, as the Mackenzie basin teemed with beaver and muskrat; however, the short summer and harsh winter conditions limited trappers' activities. During the late 19th century Fort Simpson was regional headquarters for the Hudson's Bay Company. The first fur trappers were native, but starting in the 1920s increasing numbers of European trappers entered the region. Beaver and muskrat populations were heavily depleted, especially in areas around and south of Great Slave Lake. Catholic missionary Henri Grollier founded missions at Fort Simpson, Fort Norman and Fort Good Hope between 1858–59. During the late 19th century and early 20th century epidemics of introduced European diseases swept through indigenous communities along the river, and thousands of native people lost their lives. One particularly severe influenza in 1928 killed as many as one in ten native people along the Mackenzie River. Fort Providence lost 20 percent of its population, and some smaller villages and camps were completely wiped out. Steamboat service on the Mackenzie River began in the 1880s, and the number of vessels surged in the early 1900s as the Klondike Gold Rush brought a wave of prospectors to the Yukon. The Mackenzie River was one of the main routes into the northern interior, with sternwheelers transporting passengers, domestic supplies and industrial goods from as far upstream as the Athabasca River all the way to the delta, though with several areas such as the huge rapids on the Slave River requiring portages. The route taken by gold seekers started in Edmonton and followed the Athabasca, Slave and Mackenzie Rivers as far as the Peel River, then up the Peel and its tributary the Rat River to the headwaters of the Porcupine River, which flows to the Yukon River. Many who attempted the 3,200-kilometre (2,000 mi) journey died along the way or turned back before reaching the Yukon. Oil was discovered at Norman Wells in the 1920s, beginning a period of industrialization in the Mackenzie valley. Oil was initially shipped out by steamboats, supplying mines and towns across the NWT. This demand grew when gold was discovered on the northern shore of Great Slave Lake, leading to the settlement of Yellowknife and the opening of several mines in the area. By the 1940s steamboats had been replaced by modern gas and diesel-powered craft, which continue to serve the river today. During World War II oil pumped in Norman Wells was shipped to Fairbanks, Alaska via the 1,000-kilometre (620 mi) Canol pipeline. The pipeline was considered a "fiasco", going five times over budget and losing as much as 20 percent of the oil due to poor construction. It only operated for thirteen months, shutting down in 1945. Much abandoned equipment remains along the corridor today; part of the pipeline route has been designated the Canol Heritage Trail. In 1964 the Mackenzie Northern Railway (now a subsidiary of CN) reached the shore of Great Slave Lake, to serve the new Pine Point zinc mine near Hay River. Although the mine shut down in 1988, the railroad remains an important transportation link between the Mackenzie River waterway and the rest of Canada. In the 1950s the U.S. Army Corps of Engineers proposed the North American Water and Power Alliance (NAWAPA), a vast series of dams, tunnels and reservoirs designed to move 150 km3 (120,000,000 acre⋅ft) of water from northern Canada to southern Canada, the western United States and Mexico. The system would involve building massive dams on the Liard, Mackenzie, Peace, Columbia, and Fraser river systems and pumping water into a 650 km (400 mi) long reservoir in the Rocky Mountain Trench. The water would then flow by gravity to irrigate more than 220,000 km2 (85,000 sq mi) in the three countries and generate more than 50,000 MW of surplus energy. The projects were never built due to the massive cost and environmental impact. The Royal Canadian Mint honoured the 200th anniversary of the naming of the Mackenzie River with the issue of a silver commemorative dollar in 1989. In 1997, a cultural landscape along the section of the Mackenzie River at Tsiigehtchic was designated the Nagwichoonjik (Mackenzie River) National Historic Site of Canada due to its cultural, social and spiritual significance to the Gwichya Gwich'in. In 2008, Canadian and Japanese researchers extracted a constant stream of natural gas from a test project at the Mallik methane hydrate field in the Mackenzie Delta. This was the second such drilling at Mallik: the first took place in 2002 and used heat to release methane. In the 2008 experiment, researchers were able to extract gas by lowering the pressure, without heating, requiring significantly less energy. The Mallik gas hydrate field was first discovered by Imperial Oil in 1971–1972. As of 2001, approximately 400,000 people lived in the Mackenzie River basin – representing only one percent of Canada's population. Ninety percent of the population lived in the Peace and Athabasca River basins, mostly in Alberta. The cold northern permafrost regions beyond the Arctic Circle are very sparsely populated, mainly by indigenous peoples. Most of the Mackenzie watershed is unbroken wilderness and human activities have little influence on the overall water quality, although there are some localized impacts. Some parts of the Mackenzie basin are rich in natural resources – oil and gas in the Northwest Territories and in central Alberta, lumber in the Peace River headwaters, uranium in Saskatchewan, gold and zinc in the Great Slave Lake area and tungsten in the Yukon. As of 2003 there were two operational gold mines in Yellowknife, and many more abandoned mines dot the region. Communities along the Mackenzie River depend on subsistence fishing, although there is also some commercial fishing on the river. Agriculture in the Mackenzie River basin is mainly concentrated in the Peace and Athabasca valleys to the south. The valley of the former river is considered to be some of the best northern farmland in Canada, due to the high concentration of minerals found in the soil. These conditions are expected to be improved even more by trends in climate change, such as warmer temperatures and a longer growing season. According to the British Columbia Environmental Network, "there is enough agricultural capability in the Peace River Valley to provide vegetables to all of northern Canada". The only functioning oil pipeline in the Mackenzie basin connects Norman Wells with Zama City, Alberta. Norman Wells was the main oil-producing area on the Mackenzie River until the 1970s, when new oil fields were discovered further north in the Mackenzie delta and the surrounding coastline. As of 2016, there were an estimated 166 billion barrels of oil reserves in this region. There is a proposal for a Mackenzie Valley Pipeline, which has not been built due to environmental concerns and falling oil and gas prices. The extraction of oil and gas in Alberta along the Mackenzie River headwaters is detrimental to its ecosystems because it involves the oil companies to remove large amounts of vegetation in order to make way for all of the equipment that they use to extract the oil from the ground. When the vegetation on the banks get and by removing these plants it destabilizes the soil and with the currents causes the river banks to erode, thus causing the accumulation of sediments in the river. In the event of a pipeline being constructed, the risks of pollution of the Mackenzie River are very high due to the destruction of the environment around it and the chance of an accidental oil spill that could destroy the ecosystems found inside the river. Not only do oil and gas extractions in the north are damaging to the Mackenzie River, they also have detrimental effects on the people who live on the banks of this river because they rely on the water to supply them with the necessary things that they need in order to survive: food, water, and transportation. During the ice-free season, the Mackenzie is a major transportation link through the vast wilderness of northern Canada, linking the many isolated communities along its course. Wide, calm sections of the river are frequently used to land seaplanes in the ice-free season. Canada's northernmost major railhead is located at the town of Hay River, on the south shore of Great Slave Lake. Goods shipped there by train and truck are loaded onto barges of the Inuit-owned Northern Transportation Company. In 2016, Northern Transportation Company went bankrupt, and its assets were bought by the government of Northwest Territories. Barge traffic travels the entire length of the Mackenzie in long "trains" of up to fifteen shallow-draft vessels pulled by tugboats. Goods are shipped as far as the port of Tuktoyaktuk on the eastern end of the Mackenzie Delta, where they are transferred to oceangoing vessels and delivered to communities along Canada's Arctic coast and the numerous islands to the north. In winter, the frozen channel of the Mackenzie River, especially in the delta region, is used as an ice road, firm enough to support large trucks, although travel between northern communities is mostly by dog sleds and snowmobiles. Although the Mackenzie River is generally wide and deep, navigation is "notoriously difficult" due to the locations of sandbars and shallows changing from year to year. In some narrower parts of the river, barges must be uncoupled and towed one by one through hazardous stretches, despite attempts to widen and deepening the channel by blasting. Although there are no dams along the main stem of the Mackenzie, many of its tributaries and headwaters have been developed for hydroelectricity production, flood control and irrigation. The W.A.C. Bennett and Peace Canyon hydroelectric dams on the upper Peace River were completed in 1968 and 1980 by BC Hydro. They have a combined capacity of more than 3,600 megawatts (MW). The reservoir of W.A.C. Bennett, Williston Lake, is the largest body of fresh water in BC and the ninth largest man-made lake in the world, with a volume of 70.3 km3 (57,000,000 acre⋅ft). By acting as a massive stabilizer on the water flow of the Peace River, Williston Lake reduces flood crests on the Peace, Slave and Mackenzie rivers as far downstream as Fort Good Hope. This has made the Peace Valley more suitable for farming, but has had significant impacts on downstream wildlife and riparian communities. The more stable annual flow slows down the spread of essential nutrients which builds up in the form of sediments, thus causing the river to become more polluted. Other smaller hydroelectric plants are located along the Snare and Taltson River tributaries, providing power to mines in the Great Slave Lake region. There have been many proposals to dam the tributaries of the Mackenzie River which would lead to further impacts on water quality and seasonal flow patterns. The Site C Dam on the Peace River, which would generate enough power for about 460,000 households, has been controversial since the 1970s, and a final decision on the project has not yet been reached. A potential US$1 billion, 1350 MW hydro plant on the Slave River was canceled in 2010 after an agreement could not be reached with First Nations people in the area to be flooded by the reservoir. Hodgins, Bruce W.; Hoyle, Gwyneth (1994). Canoeing north into the unknown: a record of river travel, 1874 to 1974. Dundurn Press. ISBN 978-0-920474-93-8. Pielou, E.C. (1991). After the Ice Age: The Return of Life to Glaciated North America. University of Chicago Press. ISBN 978-0-226-66812-3. ^ a b c d e f g h "Whole Basin overview" (PDF). Mackenzie River Basin: State of the Aquatic Ecosystem Report 2003. Saskatchewan Watershed Authority. pp. 15–56. Archived from the original (PDF) on 4 March 2016. Retrieved 2011-09-16. ^ a b c "Rivers". The Atlas of Canada. Natural Resources Canada. Archived from the original on 2007-02-02. Retrieved 2011-09-16. ^ a b Scheffel, Richard L.; Wernet, Susan J., eds. (1980). Natural Wonders of the World. United States of America: Reader's Digest Association, Inc. p. 220. ISBN 978-0-89577-087-5. ^ Marsh, James. "Mackenzie River". The Canadian Encyclopedia. Historica-Dominion Institute. Retrieved 2011-09-16. 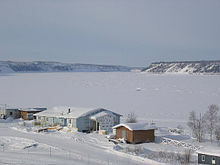 ^ "Peace River at Peace Point". R-ARCTICNET. 1959–2000. Retrieved 2017-10-28. ^ "Athabasca River at Embarras Airport". R-ARCTICNET. 1959–2000. Retrieved 2017-10-28. ^ a b Muzik, I. (1991). "Hydrology of Lake Athabasca" (PDF). Hydrology of Natural and Manmade Lakes. International Association of Hydrological Sciences. Retrieved 2011-09-16. ^ "Slave River at Fitzgerald". R-ARCTICNET. 1959–2000. Retrieved 2017-10-28. ^ "Where Does the Water Flow? - NWT Water Stewardship". www.nwtwaterstewardship.ca. ^ a b c d e f "Great Slave Sub-basin" (PDF). Mackenzie River Basin: State of the Aquatic Ecosystem Report 2003. Saskatchewan Watershed Authority. pp. 143–168. Archived from the original (PDF) on 2 April 2012. Retrieved 2011-09-16. ^ "Bridge linking N.W.T. capital with rest of Canada opens". CBC News. 2012-11-30. Retrieved 2017-10-28. ^ "Mills Lake". IBA Canada. Retrieved 2017-10-28. ^ a b c "Magnitude and Sources of Sediment Input to the Mackenzie Delta, Northwest Territories, 1974 - 94 (PDF Download Available)". ResearchGate. ^ Penn, James R. (1 November 2017). Rivers of the World: A Social, Geographical, and Environmental Sourcebook. ABC-CLIO. ISBN 9781576070420 – via Google Books. ^ a b NRCAN Topo Maps for Canada (Map). Cartography by Natural Resources Canada. ACME Mapper. Retrieved 2011-09-16. ^ Major Drainage Areas of the Yukon Territory (Map). Cartography by Yukon Environment Geomatics. Yukon Environment. Archived from the original on 31 March 2012. Retrieved 2011-09-16. ^ a b "Mackenzie River near Fort Providence". R-ARCTICNET. 1961–1997. Retrieved 2017-10-28. ^ Burridge, Mary; Mandrak, Nicholas (2011-08-16). "105: Lower Mackenzie". Freshwater Ecoregions of the World. World Wildlife Fund, The Nature Conservancy. Archived from the original on 31 March 2012. Retrieved 2011-09-17. ^ a b Watersheds (Map). Cartography by CEC, Atlas of Canada, National Atlas, Instituto Nacional de Estadística y Geografía. Commission for Environmental Cooperation (CEC). Archived from the original on 14 April 2008. Retrieved 2009-10-08. ^ a b "Great Bear Lake". World Lakes Database. International Lake Environment Committee Foundation. Archived from the original on 5 June 2011. Retrieved 2011-09-16. ^ "Mackenzie River Basin". Conservation. World Wildlife Fund. Archived from the original on 14 October 2011. Retrieved 2011-09-16. ^ Arnell, Nigel W. (2005-04-08). "Implications of climate change for freshwater inflows to the Arctic Oceans" (PDF). Journal of Geophysical Research. Far Eastern Federal University. Archived from the original (PDF) on 2 April 2012. Retrieved 2011-09-16. ^ "Water Sources: Rivers". Environment Canada. Retrieved 2011-09-16. ^ Woo, Ming-Ko; Thorne, Robin (2003-03-04). "Streamflow in the Mackenzie Basin, Canada" (PDF). Arctic Institute of North America. Retrieved 2011-09-16. ^ "The Peace-Athabasca Delta". Northern River Basins Study Final Report. Government of Alberta. Archived from the original on 27 September 2011. Retrieved 2011-09-16. ^ "Mackenzie River at Fort Simpson". R-ARCTICNET. 1938–2000. Retrieved 2017-10-28. ^ "Mackenzie River at Norman Wells". R-ARCTICNET. 1943–2000. Retrieved 2017-10-28. ^ a b "Mackenzie River at Arctic Red River". R-ARCTICNET. 1972–2000. Retrieved 2017-10-28. ^ Dewar, Elaine (4 March 2011). Bones. Random House of Canada. ISBN 9780307375551 – via Google Books. ^ Schiermeier, Quirin (2010-03-31). "River reveals chilling tracks of ancient flood". Naturenews. Retrieved 2011-09-19. ^ "The Younger Dryas". NOAA Paleoclimatology. National Oceanic and Atmospheric Administration. 2008-08-20. Retrieved 2011-09-19. ^ a b c d Wolh, Ellen. "The Mackenzie: River on the Brink." In A World of Rivers, Environmental Change on Ten of the World's Great Rivers, 300-27. Chicago: University of Chicago Press, 2010. ^ "Northern Lifeblood: Empowering Northern Leaders to Protect the Mackenzie River Basin from the Risks of Oil Sands Development" (PDF). Pembina Institute. Retrieved 2011-09-16. ^ "Mackenzie Watershed". EarthTrends: Watersheds of the World. World Resources Institute. Archived from the original on 7 August 2011. Retrieved 2011-09-17. ^ Burridge, Mary; Mandrak, Nicholas (2011-08-16). "104: Upper Mackenzie". Freshwater Ecoregions of the World. World Wildlife Fund, The Nature Conservancy. Archived from the original on 31 March 2012. Retrieved 2011-09-17. ^ "Peace-Athabasca Delta: Tar Sands Oil Expansion Threatens America's Premier Nesting Ground". Save BioGems. Natural Resources Defense Council. Retrieved 2011-09-17. ^ "Peace-Athabasca Delta". Important Bird Areas. Bird Studies Canada. Archived from the original on 2 April 2012. Retrieved 2011-09-17. ^ Pilon, Jean-Luc. "Archaeological Potential Along the Lower Mackenzie River, N.W.T." Canadian Archaeological Association Occasional Paper No.2. ^ "To the Klondike via Athabasca Landing". www.collectionscanada.gc.ca. ^ LaRouche, Lyndon H. (January 1988). "The Outline of NAWAPA". The Schiller Institute. Retrieved 2011-09-17. ^ Nelson, Barry (2009-12-04). "The Rip Van Winkle of Water Projects – NAWAPA Reemerges after a 50 Year Slumber". Switchboard. Natural Resources Defense Council. Retrieved 2011-09-17. ^ Nagwichoonjik (Mackenzie River) National Historic Site of Canada. Canadian Register of Historic Places. Retrieved 22 October 2013. ^ Thomas, Brodie (2008-03-31). "Researchers extract methane gas from under permafrost". Northern News Services Online. Archived from the original on 8 June 2008. Retrieved 2008-06-16. ^ "Geological Survey of Canada, Mallik 2002". Natural Resources Canada. 2007-12-20. Archived from the original on 2011-06-29. Retrieved 2008-06-16. ^ "Mackenzie River Watershed". Boreal Songbird Initiative. Retrieved 2011-09-16. ^ "Media Release: Significant BC food source might go under water" (PDF). It's Our Valley. 2010-04-09. Retrieved 2011-09-17. ^ a b "Peace River Valley: Habitat for biodiversity, food security for British Columbia". The British Columbia Environmental Network. Archived from the original on 14 September 2011. Retrieved 17 September 2011. ^ Investment, Industry, Tourism and. "Mackenzie Delta and Arctic Islands NWT Oil and Gas Rights". www.iti.gov.nt.ca. ^ "The $20 Billion Arctic Pipeline That Will Haunt Canada Forever". 9 October 2016. ^ Wolh, Ellen. "The Mackenzie: River on the Brink." In A World of Rivers, Environmental Change on Ten of the World's Great Rivers, 300-27. Chicago : University of Chicago Press, 2010. ^ "What does North America look like to Canada's Northern Transportation Company?". Arctic Economics. 2008-06-12. Retrieved 2011-09-17. ^ "Mackenzie River: Barging ahead – The North's Native-owned transportation service". Canadian Council for Geographic Education. Archived from the original on 28 October 2011. Retrieved 2011-09-17. ^ Jozic, Jennifer. "Transportation in the North". Northern Research Portal. University of Saskatchewan. p. 3. Retrieved 2011-09-17. ^ Van Wyck, Peter C. (2010). Highway of the Atom. McGill-Queen's Press. p. 32. ISBN 978-0-77358-087-9. ^ "40 Years On: The Story of the W.A.C. Bennett Dam". Hudson's Hope Museum. Archived from the original on 9 October 2011. Retrieved 2011-09-17. ^ "Site C Dam". Watershed Sentinel. 2008. Retrieved 2011-09-17. ^ "Williston". BC Hydro. Retrieved 2011-09-17. ^ "Williston Lake". World Lakes Database. International Lake Environment Committee. Archived from the original on 5 August 2011. Retrieved 2011-09-17. ^ "Flooding in the Peace-Athabasca Delta". Regional Aquatics Monitoring Program. Retrieved 2011-09-17. ^ Fawcett, Max (2010-04-05). "The Case against the Site C Dam: A reporter's Peace River journey against a powerful current of dubious assumptions and official spin. First of five parts this week". The Tyee. Retrieved 2011-09-17. ^ "Slave River hydro project nixed". CBC News. 2010-10-18. Retrieved 2011-09-17. ^ Jaque, Dom (2009-03-12). "Proposed Slave River Hydro Project Update" (PDF). Alberta Whitewater Association. Archived from the original (PDF) on 2 April 2012. Retrieved 2011-09-17. ^ "Some Canadian rivers at risk of drying up". WWF Global. World Wildlife Fund. 2009-10-15. Retrieved 2011-09-17. 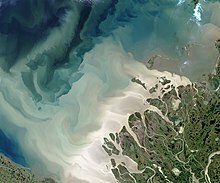 Wikimedia Commons has media related to Mackenzie River. Wikisource has the text of the 1911 Encyclopædia Britannica article Mackenzie.